Blogs that keep you up to date about digital India. 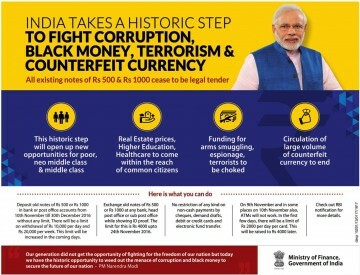 Tuesday evening Indian Prime Minister Narendra Modi announced that Indian currency denomination Rs 500 and Rs 1000 will cease to be a legal tender from the midnight of 8 November. The announcement came like a bolt from the blue. The government decision received mixed reactions ranging from stupefaction to scorn.